After a series of exercises and brainstorming sessions with various teams, we have clustered the most frequently occurring factors that positively influence Trust in teams. 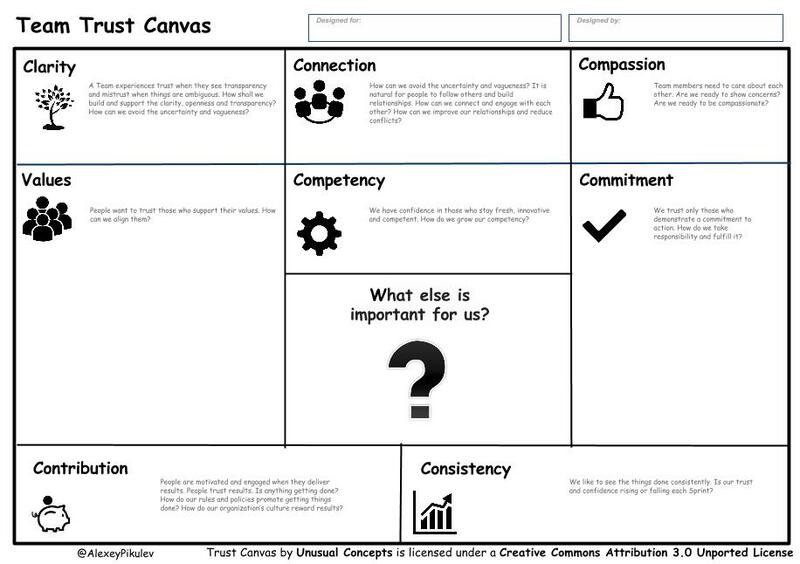 We created a new instrument which we are glad to share with you – the Team Trust Canvas (French version). The main purpose of this tool is to build a discussion around the trust and possibly generate new rules or agreements in a team. Clarity. A Team experiences trust when they see transparency and mistrust when things are ambiguous. How shall we build and support the clarity, openness and transparency? How can we avoid the uncertainty and vagueness? Connection. It is natural for people to follow others and build relationships. How can we connect and engage with each other? How can we improve our relationships and reduce conflicts? Compassion. Team members need to care about each other. Are we ready to show concerns? Are we ready to be compassionate? Value. People want to trust those who support their values. How can we align them? Competency. We have confidence in those who stay fresh, innovative and competent. How do we grow our competency? Commitment. We trust only those who demonstrate a commitment to action. How do we take responsibility and fulfill it? Contribution. People are motivated and engaged when they deliver results. People trust results. Is anything getting done? How do our rules and policies promote getting things done? How do our organization’s culture reward results? Consistency. We like to see the things done consistently. Is our trust and confidence rising or falling each Sprint? The most important part. What else is important for us? As a result, we get a visual picture which can be a starting point for building Trust in our team. In addition, this tool allows the good understanding of mutual expectations and the causes for conflict. A licensed Management 3.0 trainer and Agile coach with many years of experience of working with a variety of organizations from start-ups to international enterprise corporations. The main focus of my training is Agile Leadership practices and its applications in the organization culture. As a Coach, I am not going to tell your organization what to do but will help you to find the right solution on your own. My current passion is building an engaging creative-work culture in the team, company and community levels by using a variety of creative concepts from coaching to business games . My motto is “Delivering Value”. Your canvas looks quite suitable for a assignement for me as a Coach in a non-IT environment. For that I wanted to use your Duch version. But unfortunately the listed one is also in French. Could you list the correct version or a link to the Ducth Canvas?